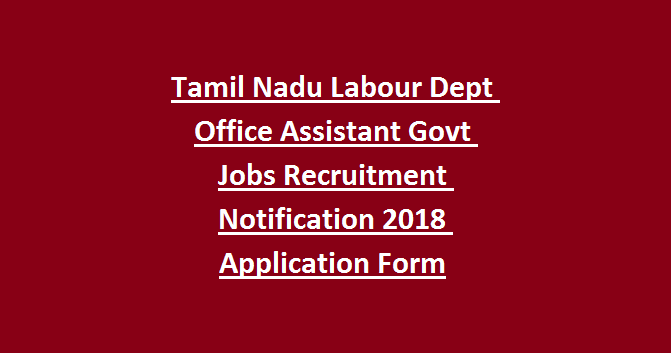 this TN Office Assistant jobs is 17-12-2018 by 05:30 PM. Application form is available for download at http://www.labour.tn.gov.in. 8th passed candidates are eligible for applying these Office Assistant jobs of TN Labour Department. Selection for this OA jobs of TN labour department will be on basis of written exam and document verification. 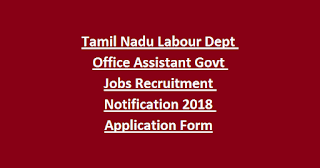 Detailed information for this Office Assistant jobs of TN labour department age limits, salary details are given below. There are total 21 vacancies in this Labour Department recruitment. Age limits cut off date is 01-07-2018. For General candidates age limits are 18-30 years. 8th passed candidates are eligible for applying this Labour department vacancies. Candidates selection will be based on written exam, interview and documents verification. Candidates can download application form from official website of www.labour.tn.gov.in. Last date to submission of application form to labour department is 17-12-2018 by 05:30 PM. Address is given in official notification.